This is fantastic news, Life is Strange 2 is confirmed to be coming to Linux with the porting from Feral Interactive once again. This has replaced the "AURORA" teaser on their Port Radar. 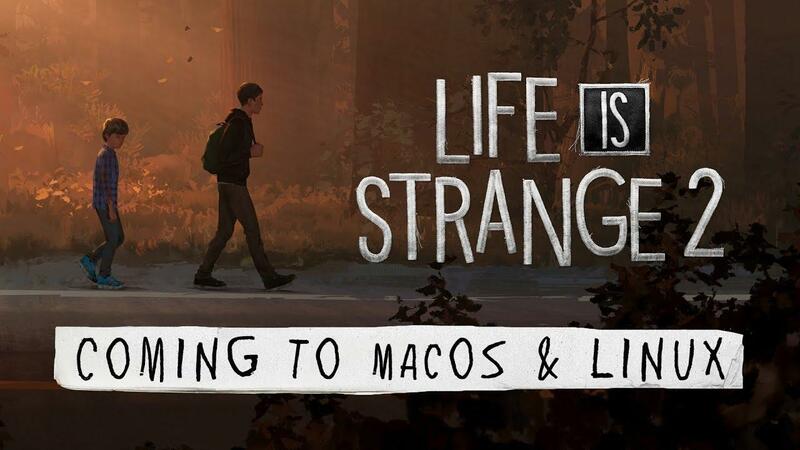 Feral Interactive today announced that Life is Strange 2, the next instalment in the much loved narrative adventure series, is coming to macOS and Linux in 2019. Originally developed by DONTNOD Entertainment and published by Square Enix on Windows and console, this is the much-anticipated sequel to 2015's BAFTA Award-winning Life is Strange. Sadly though, we will have to wait until 2019. The most likely reason, is Feral waiting until the game is essentially finished with all episodes out. I can understand why this will be an issue for some, since you will miss out on the discourse and hype surrounding the release of each episode. Hopefully it will be as soon after the final episode's release as possible. I'm glad they're announcing this quite early though, hopefully it means more people will hold off on buying it to support their continued Linux ports. Given the quality of their ports and their top-notch support, I'm happy to hold off on a single-player game. The news comes not long after Feral also confirmed Total War: THREE KINGDOMS. It seems like their previous teaser that mentioned Thursday this week, was simply about reflecting on these announcements. Since Feral have confirmed multiple times they're happy for people to purchase a game once a port is announced (as long as you hold off to play it on Linux) you can find it on Humble Store and Steam. I dont mind waiting, am enjoying the first one at the minute, frankly Im not a fan f episodic content, much prefer the whole game to be released so I can play it without breaks as sometimes I lose interest that way. Just like LiS:BtS, I wasn't sure what to think about this one at first despite my love for the first game, but after having watched a Let's Play of the entire first episode I'm totally into it. Definitely a buy once Feral has ported it. 2019 sounds great to me, no messing about with single episodes and months in between each one. Also, there´s so much else going on this autumn that there´s zero risk of running out of things to play. I'll personally be waiting until 2019, though. Never liked that "do a single episode, then wait" thing. Binge play ftw! Finally, a sensible approach to announcing future porting plans by Feral. There are games that I am eager to play upon release, even if it means booting into Windows. However, if I knew the game was to be ported native to linux, I would delay my purchase so I can order it directly from the porting studio and let them keep all the money. I find these "teasers" immature and childish. While they try to be cute, they may lose sales just because people have no idea a game they want is about to be ported. As soon as they finalize the legal paperwork of acquiring the porting rights, just say so. Don't play guessing games. I will now delay my Life is Strange 2 purchase so I can order it directly from Feral. Goldpaw I'm currently running Walking Dead perfectly there, and aren't these games built on more or less the same engine? TWD is on its own engine, LIS2 is on UE4. LiS2 also has Denuvo so it's unlikely to work well if at all. Captain Spirit launches fine but crashes after a minute or so, it also has Denuvo and UE4. As for the game itself, I'll wait until episode 2 comes out to decide whether to be happy about the port or not. For now it looks like something I don't like a single bit and it's very sad. rkfg LiS2 also has Denuvo so it's unlikely to work well if at all. Captain Spirit launches fine but crashes after a minute or so, it also has Denuvo and UE4. Eh? None of that has anything to do with Feral though. These games won't run on Proton most likely. If it will be decently playable with Proton, this may be a financial problem for feral. Not everyone does care enough to wait or buys games simply because a native port exists. That's why I'm really excited for their upcoming announcement.